I am lucky enough to own a few Babe Ruth baseball cards. I have four cards of the Babe that were produced during his playing day. This card was made 13 years after his death. As far as new Babe Ruth cards go – I'm not so sure this card can be considered new, it's 48 years old — this is a keeper. I recently rediscovered this set. I always knew of 1961 Fleers but never really considered collecting them. The set is full of the game's great players and individual cards can be had at a very affordable price. This card set me back about $20. Not bad for a card of the game's greatest. I was pretty excited to open the mailbox the other day. It was a long holiday weekend and I had a feeling there would be at least one package waiting for me. I was lucky, there were three. In one was this 1957 Topps Roy Campanella that I had purchased on eBay only a few days earlier. I was expecting this card to arrive later in the week. But there it was. A beautiful card to say the least. This is the first card of Campanella in my collection. It was listed on eBay as being in poor condition and the price was right so I went for it. When I opened up the package I looked at my new card and it looked to be in much better condition than poor. But upon further review, the card showed its true colors – or should I say folds. If you look close enough you will see the massive crease that runs across the card. It's kind of hard to see because it's hidden by the base path in the background. But believe me, it's there. Still, not a bad example of a poor old baseball card. A good catcher in his heyday as a player. Gabby Street will always be remembered as the battery mate of the immortal Walter Johnson. 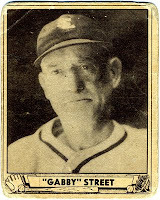 Gabby was also manager of the St. Louis Cardinals from 1930, until July 1933, winning pennants in the first two years, and the World Championship as well in the second. He caught a ball thrown from the top of the Washington Monument in 1908, a remarkable feat. Gabby also managed the St. Louis Browns in 1938. Today, he is doing baseball broadcasting in St. Louis. I'll be honest. As far as I'm concerned Topps finished third when it came to baseball card design in 1954. It's not that Topps' design is all that bad, it's more about Red Heart and Dan Dee's design being better. For small issues, Red Heart (dog food) and Dan Dee (potato chips) made some sweet-looking cards. The other problem for Topps in 1954 is that it was missing more than a few stars in its set including: Stan Musial, Bob Feller, Robin Roberts, Roy Campanella, Pee Wee Reese and arguably the most popular player of all – Mickey Mantle. I know some of you out there disagree. Some may think that this is one of Topps' better designs. 1952 is far and away the best and 1957 and 1964 are two of my favorites. While I can't argue that the effort in 1954 may have been in the top-10 overall for Topps, I just think Red Heart and Dan Dee are better.